Lawyer says Ola al-Qaradawi and husband Hosam Khalaf are ‘being held hostage’ amid Egypt-Qatar political rift. Aayah Khalaf, 31, has not had any contact with her parents in more than nine months. 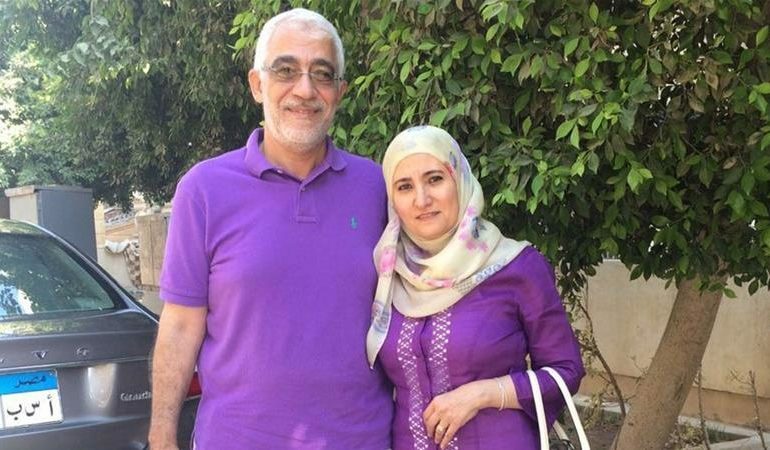 Her mother, Ola al-Qaradawi, 56, and her father, Hosam Khalaf, 58, were arrested in June 2017 by security officials while on holiday in northern Egypt. They have been in detention ever since, even though neither has been officially charged with a crime. Earlier this week, both al-Qaradawi – daughter of prominent Muslim scholar Yusuf al-Qaradawi – and Khalaf had their detentions extended by another 45 days. Aayah, a US citizen who lives in Seattle, Washington, with her husband and two daughters, said that no family members have been able to visit the couple at the prisons they are held in. “No one has spoken to them since their detention,” Aayah told Al Jazeera in a telephone interview. Before their detention, Aayah said she was preparing to welcome her parents to live with her family in the United States, where they both hold permanent resident status. She said she is especially concerned for her mother, who has been held in solitary confinement in a small cell with poor ventilation and lighting at al-Qanater women’s prison in Egypt’s capital, Cairo, since her arrest on June 30, 2017. Her father is also being held in solitary confinement, at Cairo’s Tora maximum security prison. They both say they have not been able to regularly see their lawyer, according to their daughter. “We’re going onto almost a year … and she’s been in solitary confinement for that long,” Aayah said about her mother. While they have not been formally charged, al-Qaradawi, a Qatari citizen of Egyptian origin, and Khalaf, an Egyptian national, have been accused by the Egyptian authorities of belonging and providing assistance to the Muslim Brotherhood, which is banned in Egypt. That is an allegation both al-Qaradawi and Khalaf “vigorously deny”, said Jared Genser, the couple’s US-based lawyer. Neither of them belongs to or supports the Muslim Brotherhood, Genser told Al Jazeera; al-Qaradawi is not political, while Khalaf previously belonged to a rival Islamic party called Al Wasat, which is legally registered in Egypt. Egypt’s President Abdel-Fattah el-Sisi came to power in 2013 following a coup that overthrew his democratically elected predecessor, Mohamed Morsi, a member of the Muslim Brotherhood. A year later, el-Sisi was elected president with 97 percent of the vote, and a series of measures curtailing the activities of the Muslim Brotherhood and its members – includinga wide-reaching “anti-terrorism” law – were enacted. Before this period of detention, Khalaf had been held for two years on allegations of belonging to the Muslim Brotherhood but was released in March 2016 without charges. ‘Held hostage’ amid Qatar-Egypt rift? Genser said the timing of al-Qaradawi and Khalaf’s arrests must also be considered. They were detained less than a month after a group of Arab countries, led by Saudi Arabia and including Egypt, cut diplomatic ties with Qatar and imposed a land, sea and air blockade on the country. They accused the Qatari government of interfering in their internal affairs and supporting “terrorism”, accusations that Doha denied. Ola al-Qaradawi’s father, Yusuf al-Qaradawi, is an Egyptian who lives in exile in Qatar. He is the head of the Doha-based International Union of Muslim Scholars. The Egyptian government added him to a “terrorist” list in June 2017, Amnesty International said. Human Rights Watch (HRW) also reported that the Egyptian authorities froze the scholar’s assets in Egypt for allegedly having ties to the Muslim Brotherhood. “I believe that both she and her husband are being held hostage by the government of Egypt in an attempt to try to put pressure on Qatar to extradite [Youssef al-Qaradawi],” Genser said. “Ultimately, in my view, this is very, very clear and straight-forward,” he continued. Late last month, el-Sisi secured a second, four-year term as Egypt’s president afterwinning a widely discredited election with 92 percent support. But the army-chief-turned-president’s victory at the polls was never much in doubt, as el-Sisi was criticised for pushing potential political challengers out of the race. The Egyptian government maintains what HRW describes as a “zero-tolerance policy towards dissent”. Since taking power, el-Sisi has passed a series of laws restricting freedom of expression, public protests and the work of non-governmental organisations, media outlets and anyone critical of his government. As many as 60,000 people have been arrested or charged since the 2013 coup, HRW reported, and Egyptian authorities have “forcibly disappeared hundreds for months at a time, handed down preliminary death sentences to hundreds more [and] tried thousands of civilians in military courts”. Aayah Khalaf told Al Jazeera her parents’ case must be seen within this larger context. “There are thousands of people who are detained without any fair trial or investigation,” she said. But on a personal level, Aayah said her parents’ detention has been toughest on her children. “They were finally ready for them to move in [when they were detained] and so it was a huge shock for them,” she said. Aayah said she wants the US, which provides Egypt with billions of dollars of military aid, to apply pressure on Cairo to release her parents and all the other political prisoners. “It really hurts me to know that my tax dollars are going to pay for aid for the military in Egypt, for them to abuse people and put them in prisons,” she said. Previous article Help Free My Grandparents!